Es wird noch fleißig am Feinschliff des Addons gewerkelt. 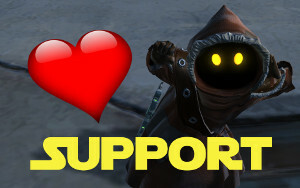 Dies belegt der reddit-User swtor_potato, der sich die neuen Dateien des PTS-Patches vorgenommen hat. Dabei hat er die aktualisierten Set-Bonis entdeckt, welche ihr nachfolgend findet. * 2 Piece: Turbulence or Force Serenity and Thundering Blast or Force Leech increase alacrity by 5% for 15 seconds. Cannot occur more than once every 30 of seconds. * 4 Piece: Reduces cost of Lightning Strike and Force Lightning or Disturbance and Telekinetic Throw by 2 and reduces the cooldown of Polarity Shift or Mental Alacrity by 15 seconds. * 6 Piece: ightning Strike and Lightning Bolt or Disturbance and Telekinetic Burst reduce the cooldown of Recklessness or Force Potency by 1 second. * 2 Piece: Activating a healing ability has a 15% chance to grant Force-Mystic’s Critical Bonus which causes your next Dark Infusion or Deliverance to be a critical. This effect can only occur once every 30 seconds. * 4 Piece: Consumption or Noble Sacrifice no longer removes any health when used with a stack of Force Surge or Resplendence. * 6 Piece: Reduces cooldown of Innervate or Healing Trance by 1.5 seconds. * 2 Piece: Ball Lightning and Leeching Strike or Psychokinetic Blast and Serenity Strike increase power by 5% for 15 seconds. Cannot occur more than once every 30 of seconds. * 4 Piece: Increases Recklessness or Force Potency charges by 1 and reduces its cooldown by 15 seconds. * 6 Piece: After using Overcharge Saber or Battle Rediness your next Ball Lightning and Leeching Strike or Psychokinetic Blast and Serenity Strike will critically hit. * 2 Piece: Wither or Slow Time increases damage reduction by 2% for 3 seconds. * 4 Piece: Wither or Slow Time reduces the cooldown of Mind Control and Mass Mind Control by 2 seconds per activation. * Dark Ward’s or Kinetic Ward’s duration is increased by 3 seconds and charges are increased by 3. * 2 Piece: Laceration and Corrosive Assault or Sucker Punch and Brutal Shots increase power by 5% for 15 seconds. Cannot occur more than once every 30 seconds. * 4 Piece: Overload Shot and Quick Shot’s energy cost is reduced by 2. * 6 Piece: Activating Stim Boost or Pugnacity will grant Enforcer’s Critical Bonus making your next Laceration and Lethal Shot or Sucker Punch and Point Blank Shot critically hit. * 2 Piece: Activating a healing ability has a 15% chance to grant Field Medic’s Critical Bonus which causes your next Kolto Injection or Underworld Medicine to be a critical. This effect can only occur once every 30 seconds. * 4 Piece: Kolto Infusion or Underworld Medicine’s energy cost is reduced by 2. * 6 Piece: Reduces the cooldown of Recuperative Nanotech or Kolto Cloud by 2 seconds. * 2 Piece: Activating a healing ability has a 15% chance to grant Combat Medic’s Critical Bonus which causes your next Rapid Scan or Medical Probe to be a critical. This effect can only occur once every 30 seconds. * 4 Piece: While in Combat Support Cylinder or Combat Support Cell the duration of Supercharged Gas and Supercharge Cells is increased by 5 seconds. * 6 Piece: Reduces the cooldown of Healing Scan or Advanced Medical Probe by 2 seconds. * 2 Piece: Heatseeker Missile and Thermal Detonator or Demolition Round and Assault Plastique increase alacrity by 5% for 15 seconds. Cannot occur more than once every 30 of seconds. * 4 Piece: Power Surge or Tech Override’s cooldown is reduced by 5 seconds. * 6 Piece: Activating Electro Net will grant Eliminator’s Critical Bonus making your next Priming Shot and Mag Shot or Vortex Bolt and Mag Bolt critically hit. * 2 Piece: Flaming Fist and Magnetic Blast or Shockstrike and Tactical Surge increase power by 5% for 15 seconds. Cannot occur more than once every 30 seconds. * 4 Piece: Flame Burst and Magnetic Blast heat is reduced by 2 or Ion Pulse Tactical Surge energy cells is reduced by 2. * 6 Piece: Dealing tech damage will grant Combat Tech’s Critical Bonus making one of your next Energy Burst and Immolate or Cell Burst and Fire Pulse critically hit. This effect can’t occur more than once every minute. * 2 Piece: Heat Blast or Energy Blast increases damage reduction by 2% for 5 seconds. * 4 Piece: While Ion Gas Cylinder or Ion Cell is active, Rocket Punch or Stockstrike reduce the cooldowns of Neural Dart and Sonic Missile or Neural Jolt and Sonic Round by 2 seconds. * 6 Piece: Increases the duration of Oil Slick or Riot Gas by 3 seconds and the duration of Energy Shield or Reactive Shield by 4 seconds. * 2 Piece: Dealing ranged weapon damage increases power by 5% for 15 seconds. Cannot occur more than once every 30 of seconds. * 4 Piece: Reduces the cooldown of Target Acquired or Illegal Mods by 15 seconds, and activating either ability restores 15 energy. * 6 Piece: Laze Target or Smuggler’s Luck now has 2 charges and its duration is doubled. * 2 Piece: Dual Saber Throw or Twin Saber Throw increases power by 5% for 15 seconds. Cannot occur more than once every 30 of seconds. * 4 Piece: Reduces the cooldown of Frenzy or Valorous Call by 15 seconds. Additionally, activating Berserk or Zen increases all damage dealt by 4% for 15 seconds. * 6 Piece: Dealing melee damage will grant Weaponmaster’s/Challenger’s Critical Bonus making one of your next Vicious Throw, Furious Strike and Annhiliate or Dispatch, Concentrated Slice and Merciless Slash critically hit. This effect can’t occur more than once every minute. * 2 Piece: Smash and Raging Burst or Force Sweep and Focused Burst increases power by 5% for 15 seconds. Cannot occur more than once every 30 of seconds. * 4 Piece: Reduces the minimum range of Saber Throw by 10 meters. * 6 Piece: Enrage or Combat Focus will grant Vindicator’s Critical Bonus making your next Impale and Furious Strike or Overhead Slash and Concentrated Slice critically hit. * 2 Piece: Crushing Blow or Guardian Slash increases damage reduction by 2% for 4 seconds. * 4 Piece: Aegis Assault or Warding Strike reduces the cooldown of Taunt and Challenging Call or Threatening Scream by 2 seconds per activation. * 6 Piece: Increases the duration of Blade Turning by 1.5 second, and the duration of Invincible or Warding Call by 3 seconds. Overload Shot and Quick Shot’s energy cost is reduced by 2. Immernoch energieverschwendung, Useless Shot bleibt Useless Shot, verplempert jetzt aber den Setbonus für nichts. Müsste man sich mal genau die neune Disziplin-Pfade anschauen und gucken ob dem Skill im Addon eine größere Bedeutung zu kommt. Wenn man sich insbesondere die 6er Setbonis so anschaut ist da aus PvE Sicht eine Menge unnützer Kram dabei. Welchen Wert hat da etwa ein garantierter Crit alle 60 Sekunden (oder noch länger)? Mit an Sicherheit grenzender Wahrscheinlichkeit wird es keine DPS Checks geben, die so eng sind, dass so ein Setbonus wirklich benötigt wird. Da könnte man sich fragen warum es überhaupt 6er Setboni sein müssen. Das war sicher wieder eine Menge Entwicklungsarbeit und mit den bereits mehrfachen Änderungen jetzt in der Beta kommt das doch ziemlich unausgegoren daher. Hat das so sein müssen? Vielleicht erhofft man sich ja, das die Spieler dadurch länger in die letzte OP für mehr BIS Settokens rennen müssen. Aber ob das aufgeht, wenn man sich manche 6er Setboni einfach schenken kann? Spannende Detailfrage am Rande: Was passiert eigentlich mit den Setboni die jetzt in Game verfügbar sind? Werden die rückwirkend geändert? Wenn nicht dann könnte es durchaus sein, dass eine Kombination aus 2 186er (für den alten Setbonus) Armierungen und 4 198er Armierungen für manche Klassen die eigentliche BIS Lösung ist. Auch wenn man Mainstat verliert. Und selbst wenn nur die 180er Settokens den alten Setbonus behalten könnte das lange Zeit eine gute Alternative sein um einen zusätzlicher zweier Setbonus mitzunehmen. Gilt natürlich alles nicht wenn man alte und neue Setboni nicht kombinieren kann. Sicher ist zumindest, dass man die neuen PvE Settokens nicht mit neuen PvP Settokens zu gemeinsamen Setboni kombinieren kann. Aber ob BW da auch in allen anderen Fällen drangedacht und die Zeit gehabt hat es richtig zu programmieren? Interessante Aspekte. Ich meine mal gehört zu haben, dass die alten Sets mit den entsprechenden Setboni erhalten bleiben, bin mir da aber nicht ganz sicher. Ich habe so das Gefühl, dass die 6er Setboni nur eine Art Bonus für den „Viel-Raider“ sind. Nice to have, aber nicht super wichtig. Bei Sentinel Set-Boni ist bei 4/6 ein Fehler. Es sind 3 % mehr Dmg während 10 Sec. wenn Zen aktivi ist.